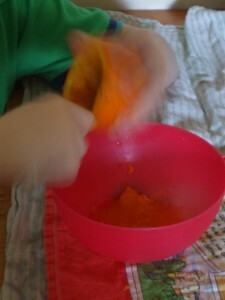 This week we have learned you can still have spooky fun, without making a mess scooping out the innards of a pumpkin. 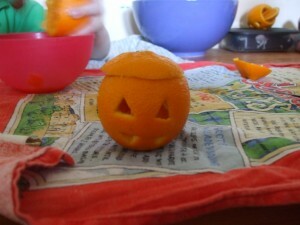 Hollowing out an orange was tricky, but less messy and smelly than an pumpkin or turnip! Filled with red jelly, these look really great. 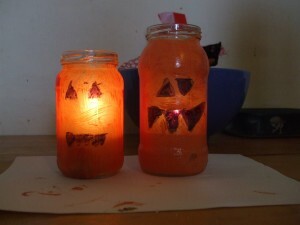 Clean jars, permanent black marker for the faces, orange acrylic paint and a tea light. Simple, but really really effective. Did you know it is World Space Week? 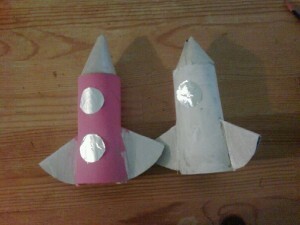 We celebrated it on Monday by making our very own rockets, we’re waiting for NASA to call. 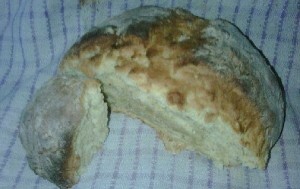 My Granny was an amazing baker, she made the most beautiful cakes and delicious bread. She doesn’t bake anymore, and I miss sitting in her kitchen watching her whip up a loaf of bread or a batch of scones effortlessly. Today I tried her soda bread recipe, while Granny would be able to measure her ingredients by eye we definitely had to use the scales. The result isn’t quite up to Granny’s standards – but it was still delicious, especially with the butter spread thick enough to leave teeth marks in!